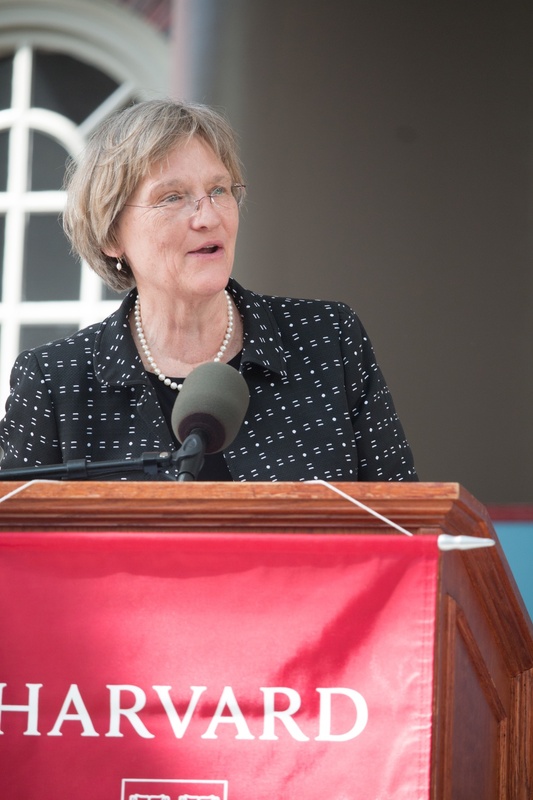 University President Drew G. Faust speaks at Commencement in 2015. Faust said she is excited to sing the updated lyrics to Harvard's alma mater at this year's Commencement. Harvard announced an immediate revision to the last line of “Fair Harvard,” the University’s 181-year old alma mater, in a Harvard-wide task force report on diversity and inclusion released Tuesday morning. The lyrics, which previously read “till the stock of the Puritans die,” will now read “till the stars in the firmament die.” “Fair Harvard,” written in 1836, has only been altered once before in its history. In 1998, the word “sons” was replaced with the word “we” to address concerns of gender inclusivity. 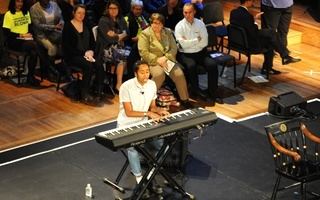 Last April, Danielle S. Allen, co-chair of the University task force on inclusion and belonging, announced Harvard would hold a competition to select new lyrics for the final line of the song. “The Task Force on Inclusion and Belonging launched this competition to affirm that Harvard’s motto, Veritas, speaks to and on behalf of all members of our community, regardless of background, identity, religious affiliation, or viewpoint,” the task force’s website reads. “I wanted something that had as much the same rhythm and vowels as possible, so it would sound the same, and the same kind of formal and flowery diction, so firmament just seemed like the perfect word,” Pascal said. “The alma mater revision is a key part of that,” Allen said in an interview last week. Pascal said she thinks the alteration to the alma mater means the song better reflects the perspectives of all Harvard affiliates. “I think it’s a very good thing that Harvard was actually thinking about it enough to decide to change what is a line too firmly focused on one small group, so I’m glad they did,” Pascal said. 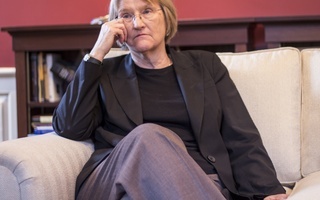 In an email response to the release of the report Tuesday, University President Drew G. Faust also referenced her desire to make symbols at Harvard more inclusive. “The task force recommendations on inclusive symbols and spaces obviously extend well beyond the Smith Center, and I have asked the executive vice president and the deans to develop additional guidelines and policies designed to improve wayfinding on campus and to ensure that public art on campus reflects our commitment to belonging and inclusion, ” Faust wrote in the email. The revision to the alma mater is one of multiple changes to Harvard symbols in recent years. In 2016, the Corporation approved the removal of a seal at the Law School after outcry from students. The former seal featured the crest of a slaveholding family that contributed to the endowment of Harvard’s first law professorship more than two centuries ago. “When it comes time to sing our alma mater, updated at the suggestion of the task force, I will proudly give voice to the song’s new final line—and its recognition that the pursuit of truth and knowledge belongs to everyone at Harvard, from all backgrounds and beliefs,” Faust wrote in her email. While we support the effort and intention behind this well-meaning effort, we do not view the lyrics revision as helpful or useful in working towards greater inclusivity. If the campus can’t support the flourishing of all, we make good neither on the promise of diversity nor on the promises made to each new member of the community.